Discussion in 'Ride Reports - Epic Rides' started by Chat Lunatique, Nov 26, 2017. Thanks for sharing your adventures,the whole R.R. was brilliant,sounds like you will be out there again soon on 2 wheels,good luck and have safe travels! Any inmates who have done this ride in Vietnam, I'm open to your advice, ta! Looking forward to the Thailand, Vietnam report. And I hear there is a New Year's party one night followed by a Full Moon party the next night on Koh Phangan. Sounds like fun! What are you riding in Thailand, Vietnam? Given the state of the roads you encountered, do you think that a Himalyan would have been a better all round ride than the Bullet, even with the Pulsar shocks ? Great RR. Matches up the visceral nature of motorcycle travel with a challenging (to say say least) landscape, road network, climate, people and culture. I'd have to qualify my reply as yes and no. You can't beat the comfort of the Bullet. Really good saddle and riding position. But the travel length of the suspension just can't handle the roads when loaded down, even with the Pulsar shocks. The Himalayan would be my choice if I do it again. reports from Vietnam. Oh yeah, your avatar is pretty cool also. Thanks for the ride....enjoyed it immensely! What a brilliant RR, Bill. I had been waiting for it for many months. Read it one straight go. Thoroughly enjoyed it And it’s always interesting to hear about India from someone else’s viewpoint; particularly someone who knows this country well but hasn’t grown so accustomed to it to lose perspective altogether. Ride safe and look forward to hearing more about your current adventures. Sorry for the late reply. I rode a CR150 Honda in Vietnam, great bike! In Thailand I rode a CBX500 Honda. Loved it so much I may ditch my 650 Versys for one. 400+ km range. That buys a lot of peace of mind in the boonies. I'll do a RR for Thailand, Cambodia, Vietnam, Laos and Myanmar when I finish this trip. Right now I'm chilling in Pokara, Nepal planning a ride up to Muktinath inthe Himalaya. yamalama and Balanda like this. Presently in Pokara ? Could you show us sneak preview please. That is a great place to chillax. On the mighty Bullet too ? Not easy. First you require residency, not available on tourist visa. Only available if you come in on a business visa, student, employment, marriage, etc. But... if you find an Indian partner you can trust, bring a load of cash and you will be welcomed with open arms. People used to buy property in Goa and then were eligible for residency, but the gov't shut that down and grandfathered existing homes. I was out of luck. So does that mean you are a "partner" via shared trust only...no legal recourse if the use wants to shrift you....like sell w/o your approval, keep the money etc. etc.? Realize this may come up or be answered later in some way but this is the point I'm at in your RR. Thoroughly enjoyed your RR.. thanks for sharing. Ride safe! I bought the Bullet from a shop in Karol Bagh, New Delhi. Because I am a non resident the bike had to remain in the name of my straw purchaser. Bikes come with one year of insurance and my contact charged +15% of the purchase price for his fee. There was a great deal of trust on my end as well because I had to wire the funds to his bank before he would buy the Bull for me. Also I had him break in the bike for 500kms and asked that his mechanic do the 1st service with me and train me on what to expect mechanically. Bullets have an even more loyal following than Harley riders as the photo shows. 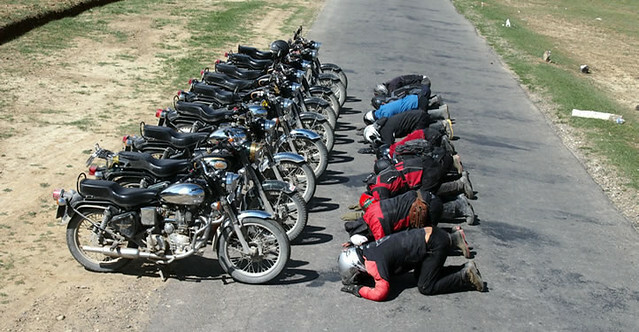 But then again, maybe they are praying that their bike will just start? Just found this via. Kams rr on the Himalayan page and looking forward to exploring this journey. Really enjoyed this RR, your writing style and humour keeps the reader engaged. Wife and I rented a bullet from Lali Singh many years ago, and toured northern India. As you said, someone with an open mind will enjoy India, and those with a closed mind will loath it. Thanks for taking the time to put this together. Excellent summary of the enigma that is India. Great RR showing so many fascinating facets and locations. Thank you! I was curious about your trip after your post on my Himalayan thread. You mentioned their road building techniques earlier. Hope you don't mind me sharing these pics from Burma that show how it's done. Drip tar over rocks using a can with holes punched in the bottom. Road base is ~ 3 layers: 1st "dragon's teeth", 2nd rock, 3rd gravel. All done by hand with pans and brooms except they had a huge modern roller to compact the rock layers. Note the toddler playing nearby while hot tar is being spread.